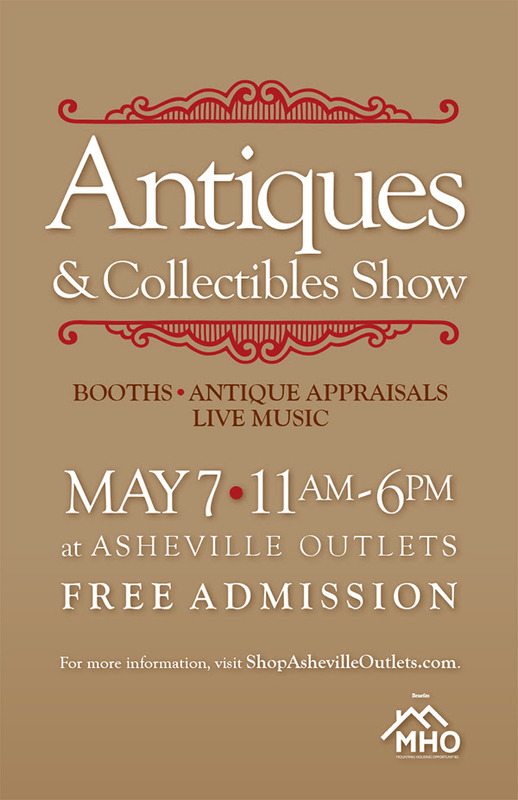 Bonnie Rose Appraisal Services, Inc., will be hosting Antiques & Collectibles Show at the Asheville Outlets. More than 100 vendors are expected to participate in the show. Twenty-five dollars from each vendor registration will be donated to Mountain Housing Opportunities. The Asheville Outlets are conveniently located near I-40 and just off I-26, Exit 33, at 800 Brevard Road, in Asheville, NC. There will also be an Appraisal Fair with Richard Hatch and Daryl Bagwell appraising antiques, jewelry, and military collectibles. A nominal fee of $5.00 per item, with a limit of 5 items will be charged and donated to benefit MHO. If you are a vendor and are interested in participating in the event or just want more information, contact Bonnie Rose Appraisals at 828-281-8110 or email bonnie@bonnieroseappraisals.com.